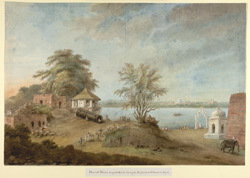 Watercolour of the Great Gun of Agra, lying unmounted on the bank of the Jumna below the Shah Burj of the Agra Fort, by Sita Ram, c. 1814-1815. Inscribed below: 'Doond Hanee or great Gun lying at Beessara Ghaut at Agra'. The Great Gun of Agra can be seen lying unmounted on the bank of the Jumna River below the Shah Burj of the Agra Fort. A small temple and ruins of Mughal buildings can be seen in the foreground along with people (some inside the gun) and an elephant. In the distance across the river is the Taj Mahal and its red sandstone gateway. The Great Gun was once one of the sights of Agra and its name is apparently a corruption of 'dhun dhvani' ('Roar of an explosion'). It was destroyed in 1833 on the orders of the Governor-General Lord William Cavendish Bentinck, for the sale of the scrap metal to finance the construction of a permanent bridge across the Jumna at Agra.